Most of the temples in South India gives Puliyodarai as Prasadham. 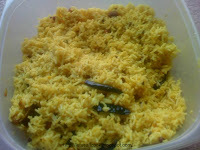 It is one of the famous rice variety in South India. It is very easy to cook and very delicious to eat. It takes about 20 to 25mts to prepare the puliyodarai paste. You can store this paste in fridge in an air tight container and use it later too. This food tastes even better when you use the paste after 24hrs of its preparation. 4 cup boiled rice for 5 person. Use basmati Rice for rich taste. Heat the oil in a pan and add the whole red chillies. Let the chillies fry for few seconds. When the mustard seeds splutters, add the fenugreek seeds. Now add the chana dal and peanuts and cook them properly in a Sim flame so that they are not burned. Add the curry leaves,chopped green chillies and hing. Then add the turmeric,as it gives the color to the rice add enough turmeric. Then add the tamarind juice to it and add the red chilli pwdr,coriander pwdr and cumin pwdr. Let the gravy cook till the oil oozes out for 10 to 12mins. Toast the sesame seeds and crush them and once the gravy is ready add the pwdr to it and cook it for another 15mins. check the seasonings and add salt . Then take your cooked rice and add the tamarind gravy to it mix it.